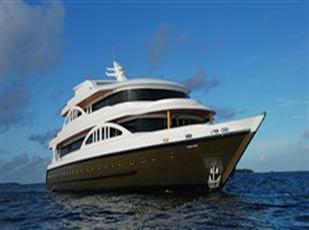 The way to travel around the Maldives archipelago in style is by cruise ship or on a safari in a chartered vessel. Safari cruising, whether for diving, snorkeling, adventure sailing, surfing, or leisurely island hopping, is growing in popularity. It is a good way to visit several islands, or unspoiled dive locations, far from resorts. This gives you a wonderful opportunity to see inhabited islands unaffected by tourism and discover idyllic, uninhabited islands that will draw your breath away. One day of leisure fun on a deserted island playing beach volleyball, beach soccer or sea-kayaking or visit an interesting inhabited spot where some cultural entertainment night prepared by island dwellers will leave you giggling with amusement. A BBQ on a desert island; other evenings include a Maldivian dinner and bodu beru dancing display by the crew, and dinner dance with a live band. Spend an evening night fishing, sitting in a dhoni and the list goes on. Colorful, unpretentious, and fun, the Divi Flamingo Beach Resort and Casino is the perfect base for vacationers drawn to the sleepy island of Bonaire and world-class Caribbean scuba diving. Spacious oceanfront and gardenview guestrooms and suites are gaily decorated in bright, tropical colors. Private balconies overlook the Caribbean Sea and invite guests to relax after a day of diving.The Divi Flamingo Beach Resort & Casino offers Divi Dive Bonaire- a PADI five star dive operation with custom dive boats, equipment, and an experienced dive crew. With over 60 shore dives to choose from, you’ll never get bored and it’ll never be easier to “dive until you drop.” Best of all, Bonaire is a diver’s paradise with conditions that make it suitable to getting wet year-round.